Survival rates are similar after primary systemic (“preoperative,” “neoadjuvant”) therapy (NST) and adjuvant therapy. Response to primary systemic therapy (i.e., pathological complete response, pCR) is associated with improved survival. In patients having a clear indication for adjuvant postoperative chemotherapy, primary systemic therapy may be indicated. In particular, in patient subgroups where a pCR is associated with improved survival such as in triple-negative, HER2-positive, and patients with some subtypes of hormone receptor-positive cancer (HR+/HER2neg/Grade3, high KI 67), PST (plus targeted therapy) should be the preferred therapeutic approach. In patients with TNBC, a platinum salt-containing regimen may be considered. 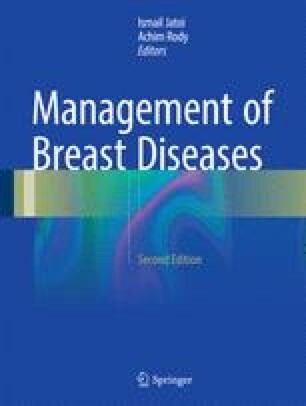 With respect to endocrine neoadjuvant therapy, in exceptional situations endocrine treatment with GnRH analogues plus aromatase inhibitor may be considered for premenopausal women. Novel predictive factors, such as tumor cell infiltration/lymphocyte-predominant breast cancer or phosphatidylinositol-4,5-bisphosphate 3-kinase catalytic subunit alpha (PIK3CA) mutation in the tumor, are promising tools but not yet applicable to the routine clinical setting. Post-neoadjuvant concepts are currently investigated in clinical trials, and trial participation is highly recommended particularly in case of non-pCR. Outside of clinical trials, there is at present no indication for further chemotherapy in case of non-pCR.